A very large percentage, if they answer in the positive to question one will reply Sally Minty-Gravett! 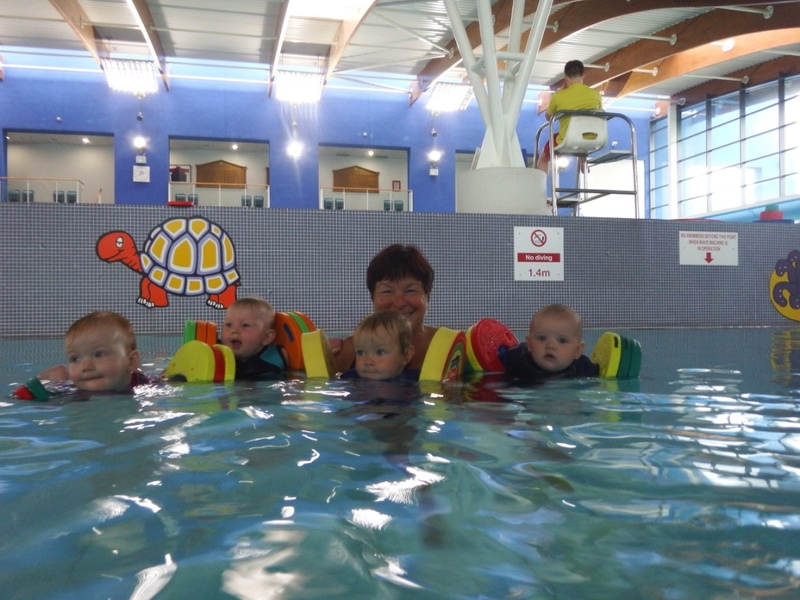 Sally has been teaching and coaching swimmers between the ages of two through to their eighties since she was a young girl of fourteen. Her first pupil was an 8 year old Down syndrome girl, Vanessa who is now in her fifties and still top of her swimming game and competing annually in many competitions and Special olympics and has won almost as many medals as Sally now!!! Sal sees her regularly and is still a ‘water baby’! On return to the family home when evacuated out of the Congo to Jersey in 1960 there were no public pools until 1971 and so her aquatic development started in the open sea at Havre des Pas pool. Joining the Jersey Swimming Club (JSC) at 4years old, all her lessons and swimming was at the Bathing Pool. The JSC at that time, operated the oldest open salt water pool in Britain at Havre des Pas, (now called the Lido) she quickly built up a strong and enviable tally of records in local competitions and was a Club Champion by the age of 10 – and a very natural love of the ocean water….. When the first Indoor pool at De La Salle College opened n 1969, followed by the first municipal pool at Fort Regent opened in 1971 the club’s activities changed, and suddenly there was swimming all year round and swimming dramatically changed monthly from 1969 onwards! She continued to dominate in many competitions, but always favoured swimming in the sea. 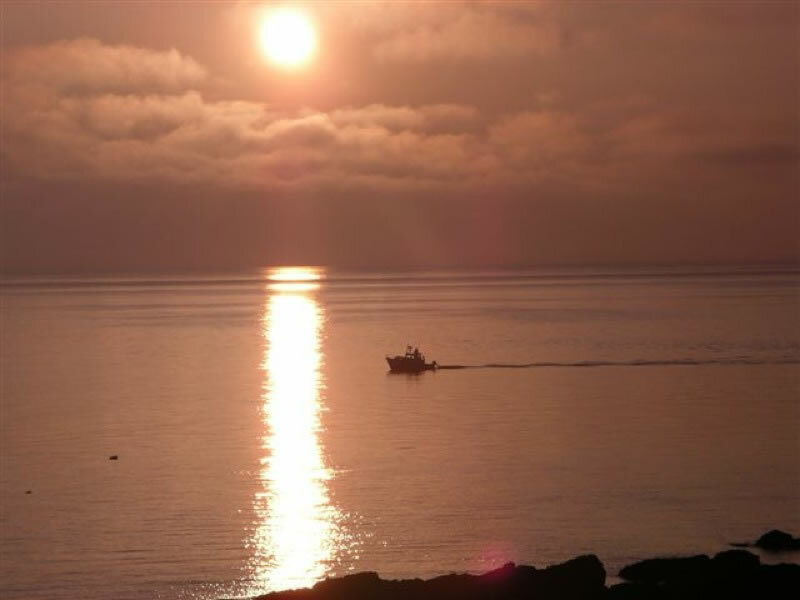 Anyhow, on leaving school she took on various jobs to keep her ‘afloat’, from banking in Jersey to child nannying locally in Jersey and then Vancouver BC Canada, Bridport in Dorset, and Weybridge in west London besides several in Jersey all the time studying for teaching and coaching qualifications. All of this time, she continued to swim and swim in the sea winning various events here and there. 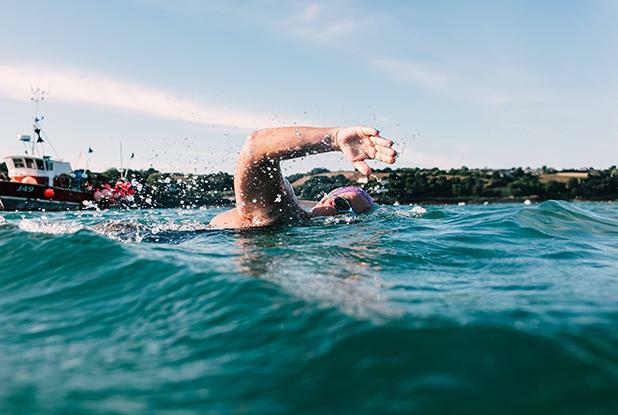 Sally wanted then to swim further field – and after watching Blue Peter introducing a 12 year old female swimmer Tina Spry who wanted to become the youngest Channel Swimmer, Sal looked into swimming Lake Windermere in 1974 – she was 17. She contacted Blue Peter for Tina’s details and her parents arranged for Tina, who lived in London, to come over to Jersey for some sea water training with Sal, in return for helping to crew for her in Windermere in the September. Sal came 2nd Lady – and the seed was sewn for a possible Channel Swim for Sal. She came home, spoke with her parents and Coach Maurice Lakeman about the possibility of swimming the Channel in 1975….Sal was currently sea swimming regularly with a small group of teens, and Linda Devereux also expressed an interest in doing the Channel too!…it also transpired that 1975 would be the Centenary Anniversary of Captain Matthew Webb’s epic first Channel Crossing and the CSA (Channel Swimming Association) were organising a Channel Relay Race to celebrate! Denize Le Pennec, a 16 year old local student had previously swum the Channel breaststroke in 1966 – and went on to successfully complete a solo Round Jersey swim, covering some 41 miles, to be followed by a Jersey to France swim in 1969 before retiring..a YOUNGEST Channel swim, completed without goggles and making the most westerly landfall, a record to last for several decades as the youngest Briton making Daily National Newspapers in the process. The Club was formed with Denize, Maurice Lakeman (hers and Sal’s coach) Jo Lakeman Linda’s coach to be) together with Sal’s and Linda’s parents, together with other parents. 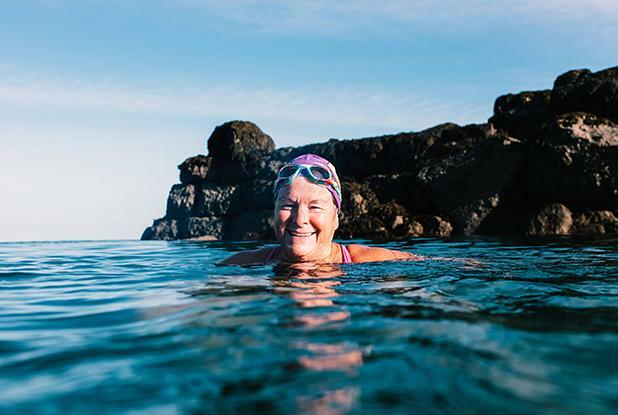 Training took place daily, weekly and when the Summer came, night swim training, boredom swims – and Linda and Sal training over 800 miles for their channel swims! The JLDSC relay team were the youngest (average age 14.5yrs) and 2nd Fastest on the day (9hrs 50mins); Sal historically met ‘Charlie’ Gravett who was in another team on the day…and 2 weeks later- Sal went on to swim the channel, England to France (first Jersey swimmer to do this course) in 11hrs 57 and Linda 2 days later 12hrs 05 mins. Sal was later awarded the first presentation of the CSA Centenary Trophy for the fastest British crossing of the year – and a week later went back to Windermere to compete again, taking 50 minuses of her 1974 time…Sal’s Long Distance swimming career had started spectacularly. So – Sal started work, went on to represent GB in Spain, Holland and Belgium in various racing events and then changed jobs from Banking to nannying – and then travelling more. Sal’s younger brother David then swam the Channel in 1977 and again in 1979. Unfortunately Anne, Sal’s Mum was diagnosed with Breast Cancer in July 1979, radical treatment followed and went into remission in 1980 – when Sal decided to travel further afield and moved to Vancouver, BC. Masters swimming continued and teaching wherever she could as well…the cancer returned and sadly, following her Mum’s passing Sal returned to Jersey in April 1983 vowing to start her swimming school – whenever she could.. but started with a return to banking and part time swim teaching too – which was to last a year after she had fallen in loveland moved to the UK to work as a nanny again in Bridport, Dorset…its amazing how quickly life can change when a relationship does to work out – it did not and neither did the Nanny job – so a new Nanny job was found in Weybridge, where Sal decided to train for another Channel swim in her Mum’s memory but raising money for the local Ambulance service to provide a Defibrillator for them. It was a great job – lots to training time available and Sal got very fit, strong and fast! Sal and Charlie then got together – and Sal decided to head back home to Jersey to work on the Swimming school dream…and she returned in January 1986. The JLDSC was doing well – Sal went straight back onto the Committee – her Dad Leslie was president – lots of events were being planned and by then Jersey had 6 Channel swimmers, including Sal & David having done it twice already! In 1986 Sally and ‘Charlie’ were wed and returned to Jersey to live. They were married in Annan, a small Scots village next to Gretna Green, this fitted well with the logistics of swimming as Sally had been selected to represent Jersey and ‘Charlie’ was the GB Team Manager for an International competition on Windermere. By this time she had begun hiring small local private pools for small groups of swimmers, her professionalism had begun to spread. Many children were being taught by Sal, and her Dad with various organisations, Tigers swimming club, ISTC, and privately in hotel pools. During this time Sal started looking after Twins – several sets of who were all friends of each other – and another family whose children she took care of – wished to build a pool within their grounds, primally for their own families use, but they looked to Sally to manage in conjunction with setting up her own swim school to be known as SWIMRITE – So the publicity of a third crossing would do her no harm, started her tally of Round Jersey swims – which she did as her training swim for the Channel swim. Success came in September 1992, from France to England – a perfect swim in 12hs 8mins with a much delayed by weather. Sal’s Dad Leslie was very proud to be on board – it was her last Channel swim he witnessed as sadly in 1997 he suffered a massive Stroke and passed away in 1998. Forever missed. (3rd DECADE SWIM COMPLETED) she returned from the swim to the building of THE pool being started. The swim school dream ‘took off’ at last – in January 1993 with some spectacular results from it’s students. It was obvious that success breeds success and many of the youngsters set their sights on future cross Channel swims. 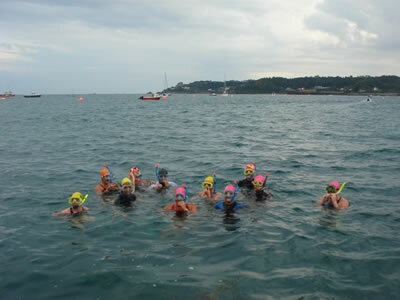 Several of the Clubs current older swimmers were taught to swim by Sal at Swimrite and have also caught ‘the bug’ with the return of good results, round Island swimmers, Jersey to France swimmers, channel and round Island relay swimmers – and are also now swim teachers and coaches in their own right…and many in training for their own Channel swims as we speak. 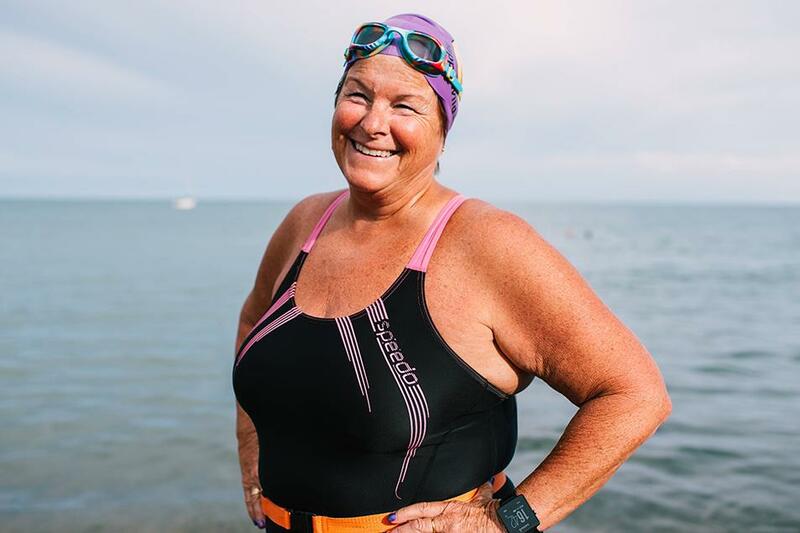 She has since gone on to complete many many successful other swims, around Manhattan Island in New York in 1999, and 2 club team relays across Tampa Bay, Florida in 2003 and 2004. In 2005 Sal completed her 4th DECADE CHANNEL SWIM – it was supposed to be a 2 way but not enough training had been done so it was a very successful one way; at 48 years old – Sal and Family were delighted and very proud. Sal swam across the Catalina Channel in 2006, (completing her US Triple crown) in California..in 9hrs 51 mins – a STUNNING swim. In 2013 Sally achieved a remarkable feat by becoming the only person in the world to complete five Channel crossings in five separate decades; 1970’s 80’s 90’s 00’s and 2013. This was meant to be the elusive 2 way – but inclement weather halted it a one way , and again, at 56 years old – EVERYONE was extremely proud – apart from a few doubters at that time! Due to emotional and work pressures Sal stepped away from the managerial role at Serco Jersey in December 2015 as well as stepping down from the President’s role of the JLDSC which she had held since 1988. Both were a huge wrench for Sal and it was very hard to walk away and still be involved – but in order to complete what I wanted – it needed to happen. After 2013 I found sponsors to pay for my 2 way – again – and rebooked for 2014 – weather was awful and never got to Dover; rolled over to 2015 – ditto. Training went well – a week in LA in Feb all expenses paid curtesy of very good friends; winning the Nevis to St Kitts swim in March; being awarded the MBE in the Queens birthday Honours list in June for my services to Long Distance swimming, primarily as President of the JLDSC for 27 years but also having taught 1000’s of people to swim in the Island…I was extremely honoured and proud. And in preparation for my 2 way, I swam around Jersey Twice in a weekend in July 2016 a month before my 2 way was booked for – and then on August 30th, 2016 finally, I successfully became only the second Club member to complete a two way crossing. Wendy Trehiou had swum both ways in 2013 in an amazing time of 39hrs 9min. My swim took 36hrs 26 min coming ashore at Folkestone. after a start at Samfire Hoe to the west of Dover…I became the 30th swimmer to complete a 2 way Channel swim, the 17th Lady and the Oldest Swimmer too! 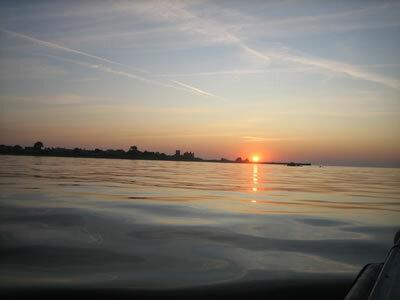 But we can’t relax there; my next (6th) decade swim is already booked in July 2020! So, my life has been all about swimming and water. I offer a Motivational talk entitled “Born to Swim” which sums it up really. My swimming history is long and fruitful and not over yet – and one I am extremely proud of…all of it. I am working on my Testimonials – but i am now ready to help YOU! Please, get in touch should you need to learn – improve – or want to be confident in the sea; I can help you with any of it / all of it!